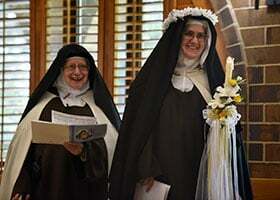 Sister Jacinta of Jesus (right) reacts with a smile as she stands with Mother Anne Teresa during her solemn profession of vows, Saturday, Aug. 18, 2018 with the Discalced Carmelite Nuns at the Monastery of the Most Holy Trinity Carmel in Arlington. (NTC/Ben Torres) Check out the photo gallery. 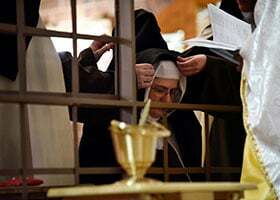 ARLINGTON—Sister Jacinta of Jesus remained stoic and focused as she professed solemn vows making her a Carmelite for life. It was only at the end of the 90-minute liturgy, held Aug. 18 at the Carmel of the Holy Trinity monastery in Arlington, that the 35-year-old’s demeanor changed. Separated by a wooden grille from the rest of the congregation, the newest charter member of the contemplative order spied her family, seated in the front pew of the chapel, and beamed. Bishop Michael F. Olson concelebrated the morning Mass along with several diocesan priests. Father Luis Castaneda, a Carmelite friar, presided during the Rite of Religious Profession. A cradle Catholic who grew up in rural northwest Kansas, Jody Lyn Gienger was a soil scientist, employed by the U.S. Department of Agriculture’s Natural Resources Conservation Service, when she joined the Carmelites in November 2012. A cloistered order dedicated to praying for the special intentions of others, the Carmelites and their isolated, peaceful lifestyle attracted the young professional. The religious community is part of the Order of the Blessed Virgin Mary of Mount Carmel and models its quiet work and hidden service after Mary of Nazareth who followed, unconditionally, God’s will. Each sister wears a scapular of the Patroness as part of her religious habit. They observe papal enclosure — meaning the nuns do not leave the monastery grounds except for medical care, and no one enters the cloister except for necessary maintenance. Sr. Jacinta’s parents, her sister, Kari Toon, and a gaggle of young nephews and a niece try to make the 750-mile trek from Kansas to Arlington twice a year. The close-knit family always enjoyed doing things together. The most difficult part of her daughter’s life in Carmel is the familial separation. Accepting God’s will is a process, she continued. The formation period for a Carmelite is six years or more and includes one year as a postulant and two years in the novitiate. Then a young woman takes temporary vows and wears the white veil for three years. Time is spent getting to know the young woman before she enters the convent. “Sr. Jacinta is at the point of making solemn vows and receiving the black veil which is the final commitment,” said Mother Anne Teresa, the prioress who chose the nun’s name to honor St. Jacinta Marto, one of the recently canonized Fatima children. The Arlington monastery currently houses 10 charter sisters and one sister who professed temporary vows. Seven hours spent in prayer each day includes daily Mass, chanting the Divine Office, and silent, mental contemplation. The nuns strive to accept God’s will for them each day. 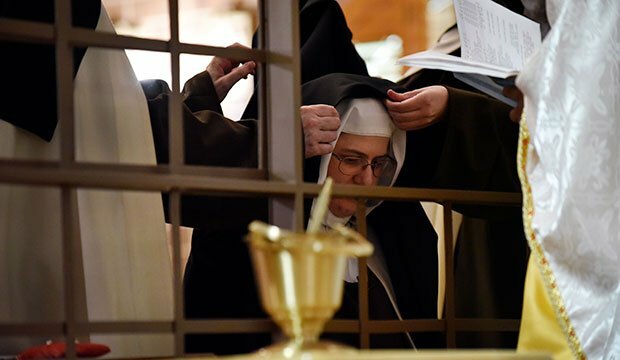 During the Rite of Religious Profession, Sr. Jacinta voiced a desire to totally consecrate her life to the service of God and his people as a cloistered Carmelite nun until death. In his homily, Bishop Olson reminded the congregation that religious vocations within religious life are distinct and not interchangeable. Each has its own nature and beauty. “And the vocation call Sr. Jacinta is accepting and promising to live out perpetually is not just a general or universal call. It has the particular character of a Carmelite,” the bishop said. The vocation to Carmel is a not a vehicle for self-understanding, he asserted. It is a gift of love and sacrifice — even if nobody else knows that in detail except Christ. 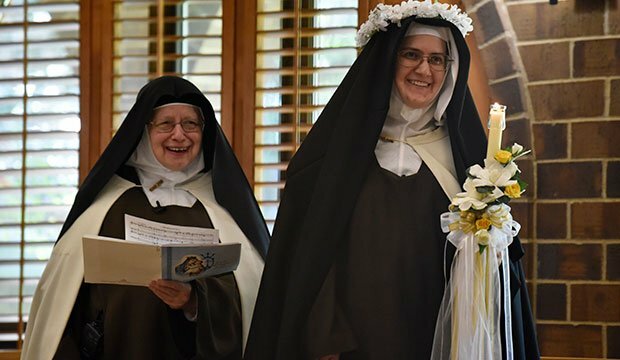 As she prepared to profess permanent vows of chastity, obedience, and poverty, Sr. Jacinta spent time in retreat and praying “for what the Lord is inspiring me to do.” The nun also took comfort in knowing her vocation, as a Carmelite, is part of a larger picture — the Lord’s plan.